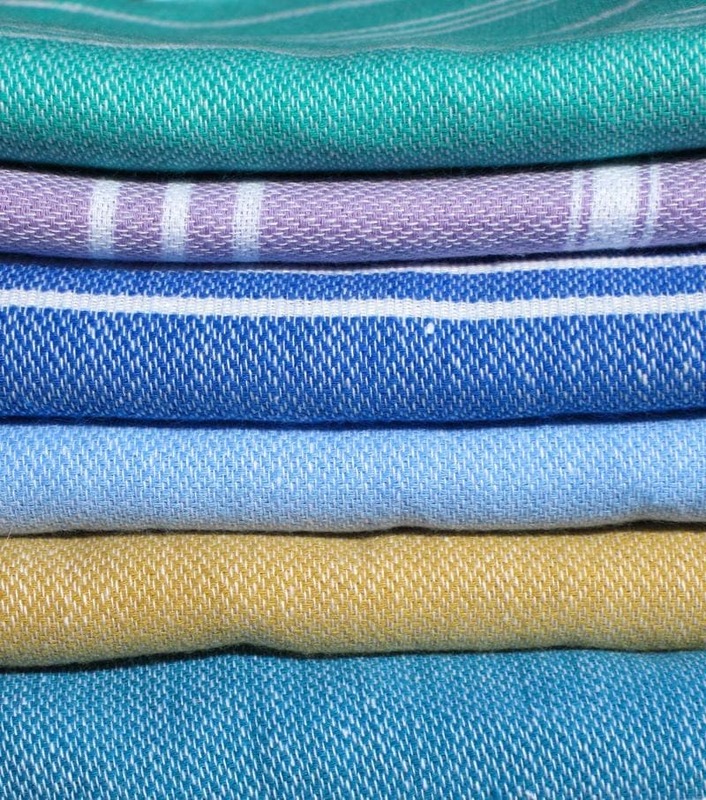 These colorful handwoven Turkish hammam towels from sorbet ltd have us dreaming of Turkey! Ethan and I have been thinking about visiting Turkey within the next year and we were very delighted to have the opportunity to review a set of sorbet-colored hammam towel hand-woven in rural Turkey. These towels, also called peshtemal towels, have a long and important history in Turkish social life and have been worn as clothing, used in ceremonial bathing of brides to be, and today are mainly associated with their use in traditional Turkish baths or hammams. Recently, Turkish hammam towels have also been popping up on beaches, pool lounge chairs, yachts, and in travelers’ suitcases as these towels are not only beautiful but lightweight, quick-drying, and made of natural absorbent fibers. We’ve used ours mainly as beach towels, but one of the problems we have with all beach towels is them blowing away in the pesky wind, and this is a particular issue with these towels as they are so lightweight. That’s where we discovered The Beach Towel Clip; these handy beach clips manufactured by jdm designs limited keep our towels firmly in place on sandy beaches. These two products have been a perfect fit for us so we thought we’d discuss them together. We have primarily featured travel-related products from American small business owners on the blog, but today we are proud to introduce two British small businesses, sorbet ltd and jdm designs ltd. The British entrepreneurs behind these companies both came up with the business idea while traveling internationally on a beach holiday—one in Ibiza and one in Turkey— and are both now selling products designed to help other beach-bound travelers. The idea for sorbet ltd began on a beach in Turkey as company Director Amanda fell in love with the colorful Turkish hammam towels. She used them on the beach, at the pool, and even as a sarong. After stuffing her suitcase full of the towels to use back home and to give as gifts to friends and families, she realized that although there seemed to be a demand for the towels they were difficult to find in England. She then managed to source a family run business in rural Turkey who were still making traditional hand-woven peshtemal towels and sorbet ltd was launched in June 2011. The company was named sorbet ltd as the colors of the towels reminded Amanda of ice cream and cool fruity summer drinks. All the sorbet ltd Turkish hammam towels are made of 100% Turkish cotton and are hand-woven on looms in Turkey. Specifically, the towels are made in a small family-run factory near Denizli Turkey where the towels are individually made in a traditional way. They are currently available in 25 mouth-watering colors, such as Blueberry, Passion Fruit, Earl Grey, Pistachio, and Pink Grapefruit! They are available in two different sizes. The large Turkish hammam towels are 180 cm x 100 cm (70 in. x 39 in.) and the small hammam towels are 90 cm x 50 cm (35 in. X 19 in.). The coloring and sizing may differ slightly across towels given the nature of the dying and handweaving processes. Pricing depends on size with the large hammam towels selling for £20.00 and the small hammam towels for £10.00, plus shipping. The hammam towels can be purchased directly from the sorbet ltd official website: http://sorbetltd.co.uk You may also email sorbet ltd at sales@sorbetltd.co.uk or call the company at 020 7627 8942 for sale inquiries or for additional information. Ethan and I expected to be offered only a couple of towels to use for the review, and were surprised when we received a very generous package from sorbet ltd containing four of the large (180cm X 100cm) towels and two of the small (90cm x 50cm) towel in six different colors! The colors are really gorgeous and we were sent towels in the following six colors: Blue Skies, Turkish Sea, Passion Fruit, Kiwi, Cucumber & Lavender. The colors and names are so yummy! The Turkish Sea and Cucumber colors were two of our favorites, but we really like them all. When examining the towels, you can really tell that these are handwoven by looking at the corners and fringes of the towels. Now one thing we were a bit surprised about is that they feel a bit rougher than we expected at first, but we found out that they become softer after the first wash. So I would definitely recommend washing them before you use them for the first time to soften them up a bit. We’ve had the towels for several months and have used the sorbet ltd towels for so many different things so far as they really are very versatile and come in handy in so many situations. They’ve accompanied us locally to the pool and to sit on during picnics and hiking trips. 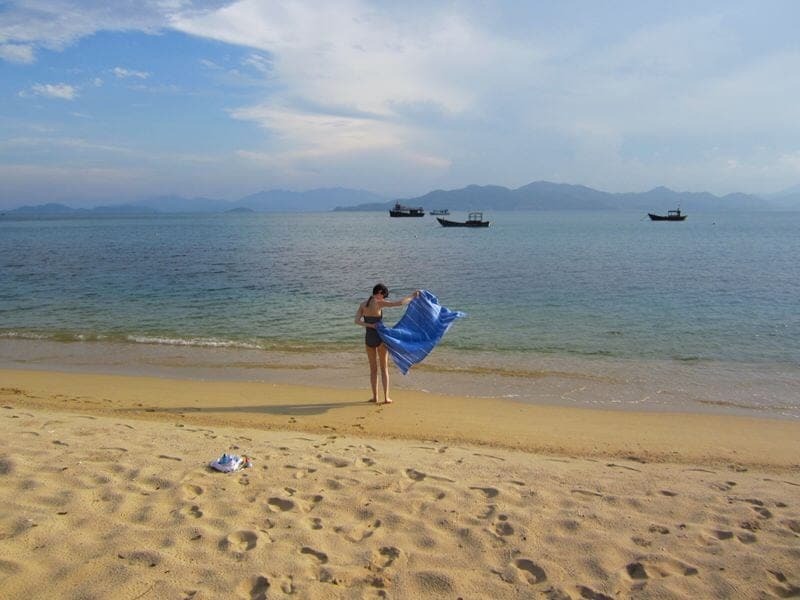 We also packed two of the large hammam towels and one small towel on our recent trip to Korea, Cambodia, and Vietnam. The great thing about using the towels when traveling is that they are compact and lightweight and can come in handy for a number of travel situations. We used them at pools, at the beach, and on boats to dry off with after swimming. 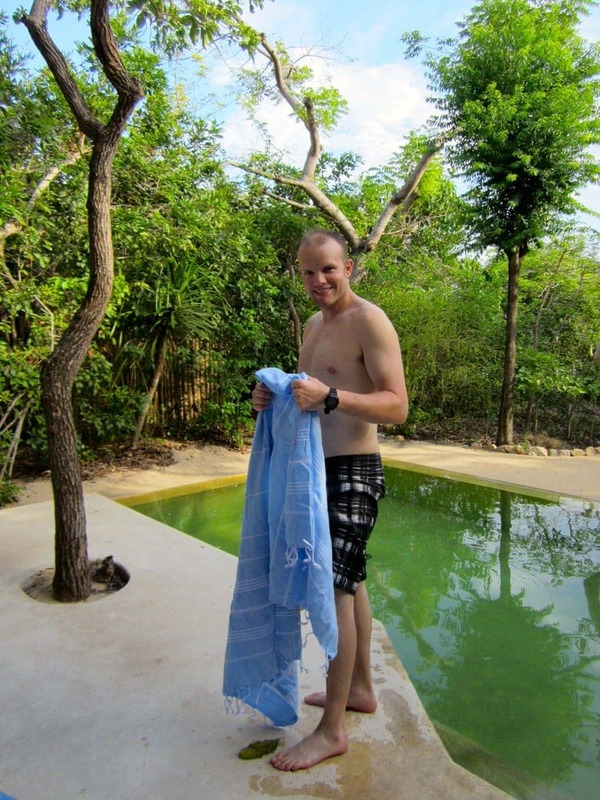 I also used one of the large towels a couple of times to cover up as a sarong while walking around the pool and beach in swimwear. 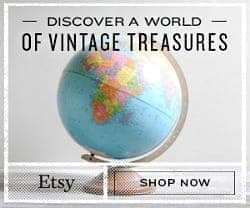 You could also pack them in your backpack or purse to use as a wrap or shawl on chilly nights or for entering churches or other attractions that require your shoulders to be covered. We have really enjoyed the towels, they are colorful and stylish, lightweight, and really versatile. As a travel towel, they are fairly compact and quick-drying; however, if you are going to be in situations where it is important that the towel dry quickly you are better off going for one of the synthetic quick-dry travel towels as these are designed to dry much faster than natural fiber towels. But if you are looking for a natural fiber alternative, I’d consider giving these hammam towels a try. Whereas our focus has mainly been on travel related uses, we’ve also used the small towels as guest towels and flung the Turkish towels over outdoor tables as stylish table covers. Whether you are looking for a swimming or bath towel, a picnic blanket, a stylish gym towel, or decorative guest towel these are really great for so many situations. so many uses, even good for table coverings and decoration! 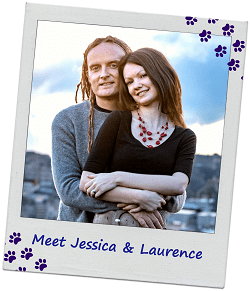 Jonathan Meare was on a beach holiday with his wife in sunny Ibiza when he found himself struggling to keep the corners of his towel in place on a sandy beach. Like most of us have done, he carefully positioned shoes, bags, and bottles at the corners of the towel to keep it in place. A thought came to him that day that there must be a simpler and more elegant way to keep a beach towel from blowing away than this. After the holiday, the idea remained and Jonathan began exploring different shapes and designs for a peg of sort that would keep the towel in place. After testing and rejecting a number of ideas, he had a working prototype and launched The Beach Towel Clip in June 2010. The British manufactured towel clips are made of polypropylene. They are hinged with one side being designed to be pushed by hand into the sand and the other side is then pressed against the top of the beach towel or picnic blanket. Note that the clips were designed to be used in sand. They may work in sandy or soft soil, but you should be careful of bending or breaking the clips. 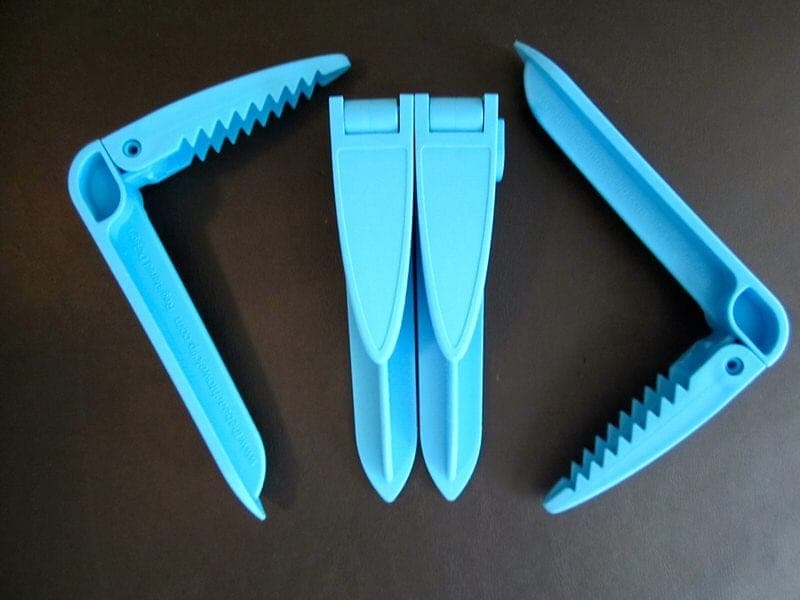 The clips are currently available in three colors: white, orange, and blue. The beach towel clips come in packages of 4 clips. Each package is currently priced at £9.99, plus shipping. Our Experience Using the The Beach Towel Clip from jdm designs ltd.
We received one package of the blue beach towel clips to review. As noted, the clips come as a set of 4 and they are meant to fit together side by side for storing, although we found they come apart in a jumbled beach bag so perhaps store them in a plastic zipper bag. They are thick, smooth, and well-constructed. When we tried them out on one of the sorbet towels, they were very simple to use. 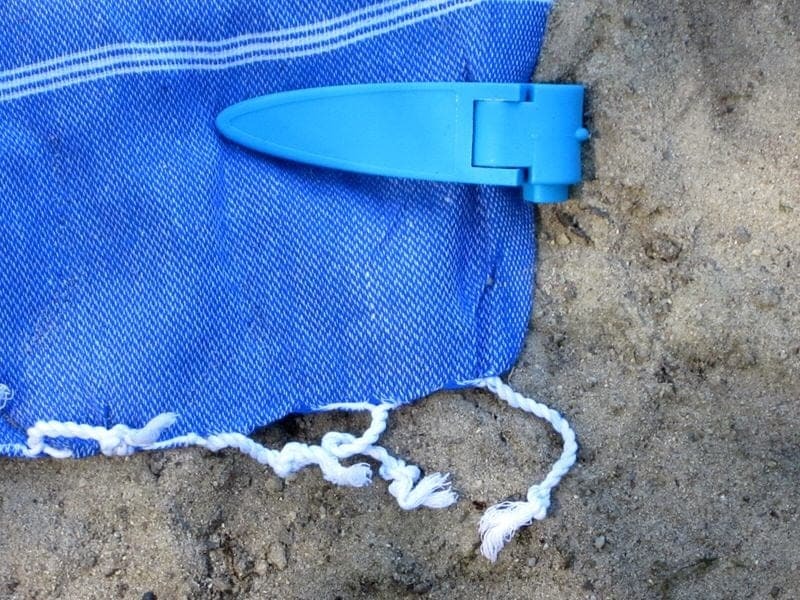 To use them, you simple unhinge them one by one, pressing the stake part into the sand next to the towel and then press the serrated side against the towel or beach blanket. We used them on all four corners and had no issue with our towel blowing away. One issue with using them on thin and lightweight towels such as the sorbet towels is that you might want to double over the fabric at the corners before pressing the clip down to ensure a tighter hold. These towel clips are definitely so much better in keeping one’s towel from blowing away than placing random items alongside the edges of our towels or blankets as we’ve done in the past. They are a simple and elegant situation to stopping your towel from blowing away. The beaches we go to in the Bay area tend to be windy and these are perfect for them. I mean if you are using your backpack, water bottle ,and two shoes to keep the towel down on the sand, what do you do when you need to actually get up and use your sandals? This can be super inconvenient and we normally are not very successful in keeping our towel in place when it is windy, but hopefully with these we’ll be better prepared! So far we’ve only used them once but hope to have the opportunity to use them at a beach again soon. 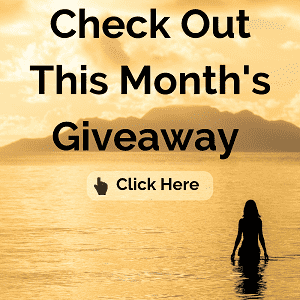 The sorbet ltd and jdm designs ltd Summer Beach Giveaway!!! Could you use your own colorful Turkish towels and a couple of sets of beach towel clips to keep your towels from blowing away this summer? Up for grabs are two (2) large handwoven Turkish hammam towels from sorbet ltd PLUS two (2) sets of The Beach Towel Clips from jdm designs ltd. This is a great $100+ value and includes free international shipping and handling! Best part is that you get to choose the colors (subject to availability) of both the towels and the clips! The giveaway starts today and will run until July 15th. A winner will be chosen using a random number generator and will be notified by the e-mail associated with the winning comment. Winners must reply within 72 hours or another winner will be randomly chosen, so please use an email that you check often when you comment. Just follow the easy rules below to enter the giveaway! GIVEAWAY IS CLOSED. CONGRATS TO OUR WINNER NATALIE B.! She chose her towels in the Blueberry and Strawberry colors complimented by white beach towel clips! 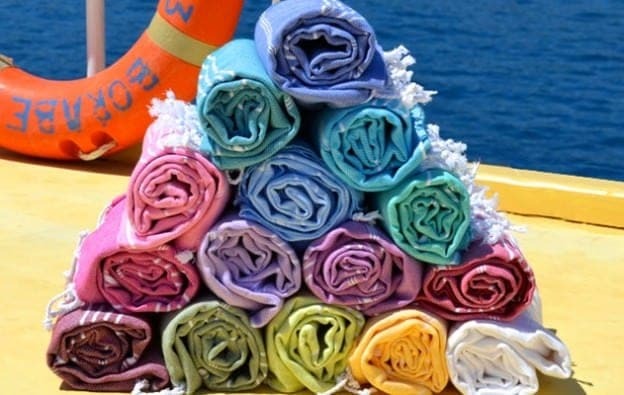 Don’t forget to stop by and check out the colorful hammam towels at sorbet ltd and the innovative Beach Towel Clip! If you have any questions about the products or giveaway, just ask! Great beach clips and i really like the white clips. I would choose the Cucumber Turkish Towels with the white towel clips. I would use these at the beach on the lake. I like raspberry towels with white clips. I’d use these towels at the beach. Thanks for the giveaway! I would love the lime and blueberry towels with a white clip. I would love to use them at my neighborhood swimming pool. The towels are beautiful and I love the colors! I would take them to the beach in Gulf Shores, Alabama when we vacation there! I would like to have the turquoise towel and the blueberry towel. I would also like the white clips. These would be great for my family to use out by our pool. I love the Kiwi and the Blueberry towels! The clips in aqua blue would be my choice. I would gift these to my niece & nephews, so they could take them on their vacation in Florida! I would choose Lavender and Turquoise coast towels and I would choose white clips. We would take them to the Ohio Street beach in Chicago. I would choose the Blueberry Towels with White Clips to use at the ocean! cucumber & lavendar towels, and as for the clips, i like white! I would choose the pink grapefruit and cucumber towels and would coordinate them with the white and aqua clips. I would use them at the beach and at the pool. I would love the Lavender and the Raspberry towel and Aqua Blue and Orange clips, i would use these when we go camping in another month. The raspberry and blueberry towels are fantastic colors. I’d just go with blue clips and hold those suckers down at our beach house! In love with these towels! I’d possibly go with Turkish Sea and Kiwi. White & blue clips. We do a beach trip with family friends every year and these would definately join us! ginger and by the pool. For the towels, I’d love the satsuma & cucumber. And for the clips, I’d like orange & white! I’d love the lavender towel and the white clips and kiwi towel with the aqua clips, one for me one for the man! We would love to show them off at one of the white sandy beaches in Florida!! Id pick the pineapple and licorice colored towels and the white beach clips. These are beautiful, and I haven’t seen anything like them. I love so many colors, like pistachio and turkish sea. If I could choose, I would probably go with the white clips- boring, I know, and the lime and pink grapefruit towels. I like apple and red currant and I like the aqua clips. I would use them in my kitchen. I would love the towels in Lime & Cucumber with the clips in orange. We would use them on Captiva Island for our 25th wedding anniversary this year! I would love the cucumber & pineapple towels and white and aqua clips. I would you them at the lake. Thanks! I love the red currant and the cucumber towels and I’d use them with a white clip. I’d love to take these on our family trip to the beach. My husband and I would love to use these on our trip to Destin this summer! We like Raspberry and Kiwi for the towel colors and aqua blue and white for the clip colors. Wow, those are gorgeous! I’d use these right around my home. The color towels I like most are “Blue Skies” and “Blueberry”, but I really like ALL the great colors! As for the clips , I like the “aqua” the best. Great prize. Thanks and God bless! i would like to use these at the pool! for the towels, i like black currant and licorice! for the clips, i like white! I would choose the licorice and the lavender for the towels. I would choose the orange clips. I would like to use them on a beach but most likely would use them in a yard, sunbathing. I would pick the cucumber and pink grapefruit hammam towels along with white beach towel clips. I would use them when I take my kids to St Pete beach and when we go fishing. I would like the blue skies color in the towels with white clips. I would hang them in the guest bathroom. I’d like the Turkish Sea colored towels. I’d like the Aqua – Blue clips. I’d use the towels by the pool and on a picnic. I’d use the clips on the beach with the towels! I would pick towels in liquorice and clips in white! I’d get the cucumber and pink grapefruit towels and the blue and white clips. I’d use them at the beach because I live nearby, I’d love to use them in an exotic locale such as Tahiti. I would choose the redcurrant and the cucumber towel colors and the aqua-blue and white clips. I love the cucumber and raspberry towels, and I think the white towel clips would coordinate best with both of those. I’d use these towels at the beach as well as the next time we go to the lake. I love the cucumber and ginger towels with white clips! I would use these at the beach, my husband loves surfing during the summer! I would choose the grapefruit and turquoise with white clips. I would use them when my family and I go to the lake..
i LOVE the cucumber and strawberry towels! Such beautiful colors, so hard to choose! The white clips would go with any color so I would choose those. I would use them on our trip to the water park we go to every year in August. I like the liquorice and redcurrant Turkish towels. I would pick the white and orange beach towel clips. I would use them at the beach or pool. What a great giveaway! These would be absolutely perfect at the beach! I love the earl grey and licorice colours…. I realize they aren’t very flashy but they are very me 🙂 The simple white clips would do just fine! Tough to choose a favorite, and I’ve already changed my mind so many times. I think I’d go with Kiwi and Strawberry, and then pair them with white clips. We finally got a pool, so I’d take them straight to the backyard to lay out by that! I think I would like the Aqua-Blue clips for both sets and the Turkish Sea and Kiwi colors for the towels. I would love to use them anywhere! We do have a creek that runs behind our house that has sandy beach like sides so it would be fun to go clip the towels down and hop in the water as the temperatures continue to rise for the summer. So many options! I think I would go with The Earl Grey towels and the white clips! I love the Ginger Hamman towels and the white clips! I would take them on vacation to Panama City, Fla. this summer, thanks! I would like 2 Turkish Sea towels with white clips. My husband, boys, and I love the beach! We go a lot! I would go with blueberry and lavender for the towels because my favorite color is purple, and white clips. I would use them on to cover the lounge chairs at the pool this summer! I would get kiwi coloured towels with blue towel clips. I like the ginger towl and white clips. All the colors look great though. I would take them with me in September to the Outer Banks, North Carolina. Cheers! I also like the Turkish Sea and Cucumber in the towel, and the white beach clips. My husband and I would take ours to the beach in New Hampshire, and also to South Carolina later this year! Love the gorgeous colors, and that these are natural fibers. So pretty! I’d go with the blackcurrant and redcurrant hammam towels, plus 2 sets of the white clips. I’m in the Boston area for much of this summer hanging out with my sister, so we’d use these on trips to local beaches & down to the Cape. I would want cucumber and lavender colored towels.I would want two sets of clips in white to match. Love the Red Currant and Black Currant towels with the white clips- I would use these all the time – we have a pool and are in the sunny Southwest, these would be perfect! I had always assumed a turkish towel was a thick loop terry, nice to see this more appropriate option for the beach. I love lavender, but the boys are more pistachio and 2 sets of white clips would be perfect! It’s nice to see you sharing your passions! I would choose pistachio and blueberry for the towels and the white clips! If I won, I would use the towels to lie outside with my baby or inside for tummy time! These look lovely! For the towels my colors are pink grapefruit and Turkish sea. I’d like one white and one aqua blue set of beach towel clips. We would choose the liquorice and cucumber towels. Fabulous colours! The white clips would be perfect with both colours! I would like satsuma & pistachio towels, and white clips. I would love to use these at our local lakes! I would use them at the park with my baby. Turquoise Cost and Cucumber with Aqua-Blue clips. I would love to try these as a beach towel. Beautiful colors! I think I would go with the Turkish Sea combined with the aqua-blue beach towel clips, looks like they would fit nicely together. I would try them in Western Australia on the beach! such pretty colors! towels: kiwi, pink grapefruit; and towel clips: orange, white. I’d take them to cancun! I would pick in Turkish towels in cucumber and apple, and the clips in white. I would use these at the lake. I love the royal blue and the pink! They are huge that is awesome for the beach! I would love the blue clips and it would be great to use at the beach or actually on the boat because it gets hot on there sometimes! My favourite towel are turquoise coast. and redcurrant combine with Aqua Blue Clip. These are great towels. What a nice alternative. I would pick Red Currant and Black Currant as the towel colours and white clips. I would use these at the beach around the corner from my house here in Barrie, Ontario. Turkish Sea; white clips, probably when I lie out at the lake! I think it would be hard to go wrong with Turkish sea and aqua-blue clips. In my daydreams, I’d take them to the beach in Croatia! My two favorite beach towel colors are Pistachio and Blueberry. I would choose the towel clips in Aqua. I would use these wonderful towels at the lake by our house. I would pick Blue Skies and Turkish Sea (unless Regatta comes back in stock, then I’d pick that one instead), with white clips for both. I would use them on the beach at the lake by my house. I like the tuquoise coast. These would be great for the beach. So many beautiful choices! Love the Turkish Sea (that blue makes me want to go on vacation…) and pistachio. As for the clips: I like the aqua blue and orange (my bf would be very happy since he’s Dutch). 🙂 What a great giveaway and hope you’re enjoying your summer! I would pick liquorice towels and white clips! Would be lovely to use them on my next trip to Venice (which is, sadly, still more than a year away)! Jessica, I love Turkish Hamam towels, and if you do get to Turkey this summer, they’ll certainly come in handy! Their colors truly are mouth-watering. I’d love to have that covering my whole body or be like my bed in the beach.. or be my blanked when it gets cold. Lavender and blueberry towels (they are lovely) with all-white clips. I’d pick the blueberry and spearmint towels and the white towel clips. I’d use them at the pool! Lovely giveaway! I would love the rosé and regatta with white clips and I would use them at the beach. I will be in Panama Beach most of the time. Thanks so much for the giveaway! I would choose the Blueberry and Cucumber Hammam towels. I would choose white towel clips! I would choose the lavender colour towel and white coloured beach clip. I would take them to the beach in Tobago. I would pick the pistachio towels and the white clips and I would take them to my vacation – to Greece. Thanks. I would use these babies at our backyard pool. I would use them at the Black Sea. I would love to have the Turkish sea and Apple hammam towel colors! I’d probably pair the orange colored clips with these towels so they stand out and I won’t forget to grab them! I’d love to use these towels and clips at the beach that we always go to in Seagrove Beach, FL! I would pick Turquoise Coast & Cucumber with white clips. I would love to use/wear them at the beach and the pool!! Thanks for having this awesome giveaway! Hello! These are so cool! I would pair the colors Strawberry & Blueberry with a set of white clips. I live 20 minutes from the Gulf of Mexico in Florida. Thus, there are many, many beautiful beach I would take them to. So fun! Thank-you!! I would pick pineapple and passion fruit and I would use them in the kitchen. I really like the Blueberry and Apple colors! And I would pick white clips! I would use them this summer at the beach and next summer at a destination wedding we’re going to! I would pick the strawberry towels and the white clips and I would take them to the hotel at the lake where we will be staying on vacation. I would get the turkish sea towels and the organge clips. I would take this with me on my upcoming wedding in Playa del Carmen. The clips are an interesting idea.. I’m guessing you’d need to use them in fairly packed sand? I’m wondering if the sand would slowly erode otherwise. Hi Kalliste, I think that the clips should work on most beaches based on our experience as they go in a few inches deep. But I guess if the sand was quite loose they may not work as well, so you might want to pack down the sand a bit with your foot first in that case or get it wet. Good luck!! Turquoise and Turkish Sea are my favorite colors and the white and aqua-blue beach clips match these perfectly. I’d like to use these on vacation this summer and at the beach with my friends. Lovely looking towels and cool clips. I’m a sucker for textiles. Have a great weekend. Can’t wait to go to the beach in 4 weeks. Those towels are just so gorgeous and I could see myself using them for so many different purposes! I’d pick lavender and Turkish sea for my towel colors and I’d pair them with blue and white towel clips. I could see myself using these on a beach trip to Florida, but also on local picnics or summer movies in the park. These are so beautiful! I have decided I need cucumber and blueberry in my life! They are so pretty. They need to be anchored with white clips. I am going on vacation to Maine in August and these would be perfect! So hard to pick just two colors, I want a whole rainbow! I love the Lavender and Cucumber hues paired with white clips. I’d use them on the shores of Lake Michigan this summer (and hoping for some more exotic locales, but no trips planned yet). Hola! I was just talking to family about these versatile Turkish towels this last week. I would love to try one out in Honduras where I have moved to from the USA. 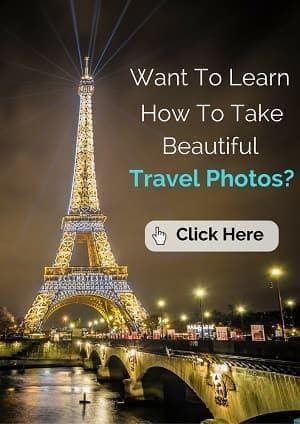 They would be great for my travels and we have a trip coming up in Sept. Headed to Roatan – an island off the mainland. They would for sure come in handy and would get a lost of use. I normally pick everything pink. My daughters call me pink mama – hahaha! So I think I would try a different color. The Turquoise Coast and Blueberry towels with the white clips would be super fabulous!! So glad I liked your FB page the other day – that way I found out about the entry. These towels are so beautiful!! I love the Kiwi and Earl Grey colours most. The Beach Clips I would get in white. How ingenious are those? 🙂 I would definitely take these towels along with me to the sea on England’s south coast this summer, as well as a little trip down to Italy. Fingers crossed!! So fun! I love the cucumber & pineapple towels and white and aqua clips! I am dreaming of a beach escape to Mexico, but I would also love to use them for an Oregon Coast picnic day! I’d have to go with liquorice and ginger for the turkish towels plus two white clips – forever neutral! While I’m not much of a beach person, I’m envisioning wrapping up in one of them when I take my flight back to Russia and on those chilly nights camping out in the forest! So many great colors, it is hard to choose! But I think I would pick the Pink Grapefrult and Turkish Sea sorbet hammam towels (a sort of his and hers for my husband and I) and 2 sets of white beach towel clips. Those clip things would be really useful, good idea. 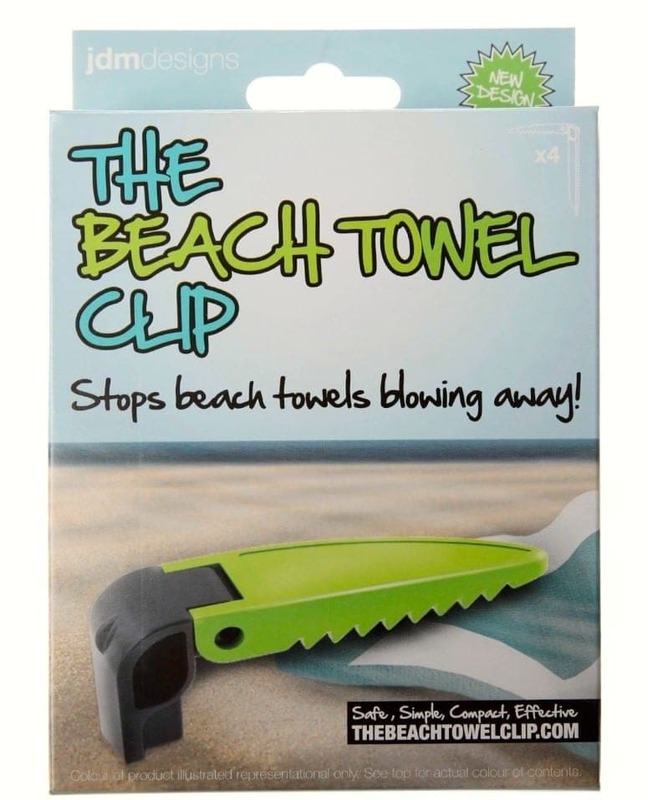 I would use the towels everywhere and the clips at our local beach all summer! 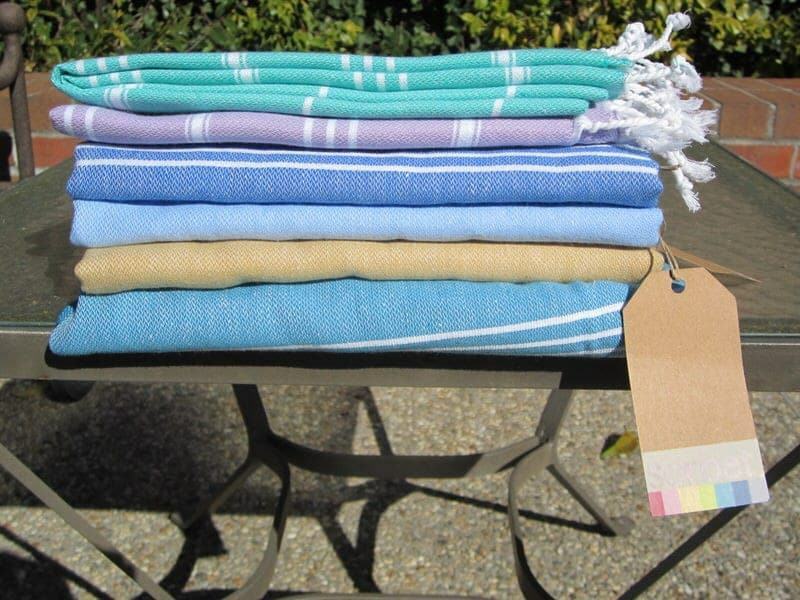 I purchased Turkish peshtemal towels as gifts and people loved them. Try these guys. Thanks Molly for your comments. 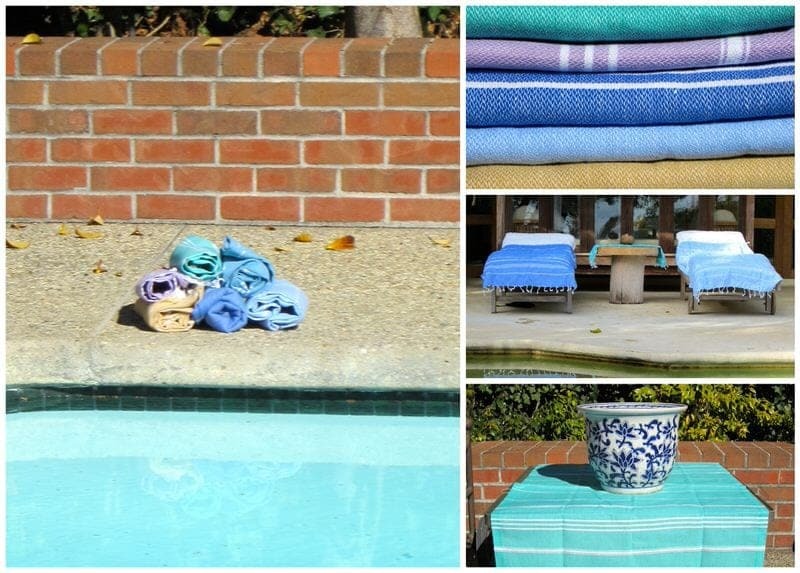 Glad you loved your Turkish peshtemal towels!